When Wilson Services performs our routine maintenance on your tank, after pumping the tank clean, our techs will locate the inlet and outlet areas of the septic tank and assess whether the baffles are currently in place and in acceptable condition. 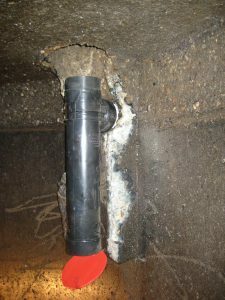 If they find either to be deteriorating or missing, a small investment in a baffle replacement is an excellent way for the homeowner to extend the life of their septic system. Septic solids, fats, oils and grease waste must empty into the tank and stay there, until your regular pumping maintenance is completed, in order for the onsite waste water system to function as designed. The line entering the septic tank from your home is an “inlet” line. This line has an “inlet baffle” installed on the inside of the tank. 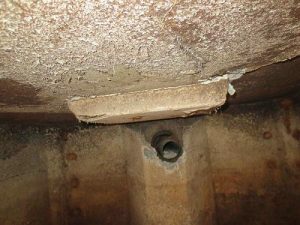 A properly maintained inlet baffle directs incoming waste downward, below the liquid level, minimizing disruption of the liquid and solids layers inside the tank. 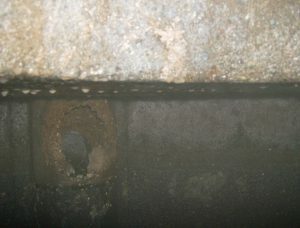 Without a properly functioning inlet baffle, the solids, as well as the floating top layer, often labeled the FOG (fats, oils and grease) and/or Scum layer, may overflow to the outlet line, consequently, also flowing to the absorption component, whether a “field” or “seepage pit”. On the “outlet” side of the tank, a line leaves the septic tank towards the absorption component on each system. This line should have an outlet baffle, which prevents the scum layer and any retained solids from entering the disposal area or leechfield. A disintegrated and/or missing outlet baffle needs to be repaired in order maintain the integrity of the disposal area. During our routine maintenance, or during a home septic system inspection, the technician may find the condition or either baffle to be unacceptable or missing. Our staff will contact you for a quote to replace the baffle, in order to keep your system functioning at its best. Call us today if your have questions or need a repair! 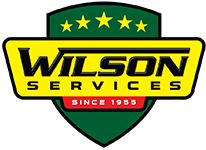 973-383-2112 or email us at info@wilsonservices.com.